Orthodox or Roman Catholic Pilgrimage Sites in Washington D.C.? 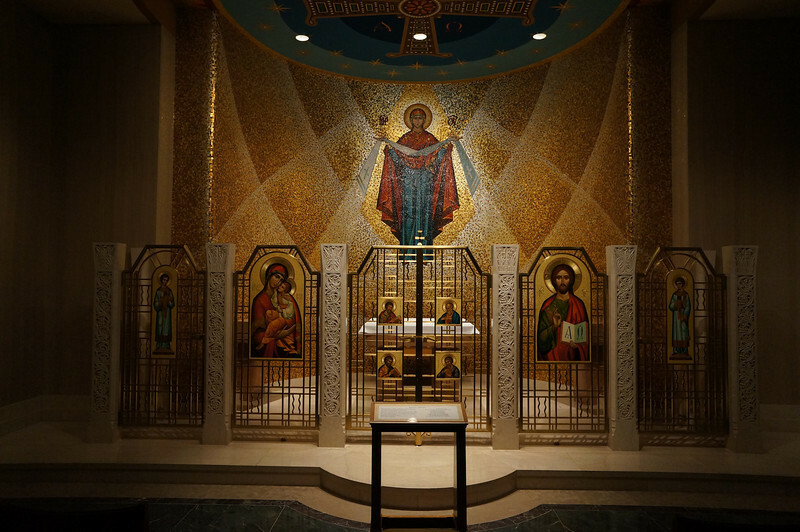 Topic: Orthodox or Roman Catholic Pilgrimage Sites in Washington D.C.? Hello all. I'll be in Washington, D.C. this weekend for a very delayed funeral at Arlington National Cemetery. While I'm there, I'll have most of Saturday free to go around the city and was wondering if there were any particular noteworthy places that I should visit. For example, notably breathtaking churches, churches with special relics, etc. I threw the Roman Catholic churches in the mix because I know that some of their churches have huge collections of relics with many shared saints. Anyway, I know it's not really a likely place, but it seems like every time I travel I find out about some significant Christian site after the trip, so I was trying to prevent that this time around. So Let me know if you know anything I need to know about. Thanks. Re: Orthodox or Roman Catholic Pilgrimage Sites in Washington D.C.? I went to the Basilica of the IC when I was in town. It has some cool-looking stuff (including liberalized Eastern Catholic inconography) but no relics or anything. I wish I had gone to some Orthodox cathedral. Well, there's St. Nicholas, the OCA Cathedral on Massachusetts Ave. and they're having a special event on Satuday morning. St. Sophia, the Greek Cathedral is a short way north up Mass. Ave.
A trip to St Nicholas' is recommended if they are having a Saturday event and/or you want to go there for Vespers. The ROCOR cathedral is also recommended. However, outside of liturgies or other events, I don't believe the churches are generally open to the public. (which is why I exclude Hagia Sophia - IIRC it doesn't have Saturday Vespers). As for RC sites, the National Basilica near Catholic University is a major site that's open for visitors all day. Same can be said for St. Matthew's Cathedral downtown. IMO the RC church in DC with the best architecture/art, St Dominic's in L'Enfant circle, will be open before/during 12:00PM Saturday Mass. The PECUSA National Cathedral is nice, but not terribly so and sometimes a bit quirky. Note that all of these places are not trivial trips by car from Arlington National Cemetary (due to the fragmented planning of the city), and are somewhat time consuming to get to by subway. Finally, if it's relics you're looking for, I'm not aware of the situation at other parishes, but a Greek Catholic parish in McLean, Holy Transfiguration, has a large piece of (what a Vatican letter displayed nearby says is) the true Cross, relevant relics attached to their numerous panel icons, as well as a fairly large and diverse reliquary of Greek Catholic/Orthodox saints. However, it's again only open around Vespers-time on Saturday. It's also inaccessible by subway or convenient public transportation. I can only assume you're referring to the Ruthenian chapel down in the crypt. What is "liberalized" about it? That's not in the Ruthenian chapel (it actually dominates the apse in the main church) and, while certainly a bit gauche IMO, isn't "liberalized" more than just "ugly." As to the OP, I highly suggest St. Nicholas as they have quite a collection of relics out for veneration. Alveus, may I ask: What is old Orthodox Catholic Serbian/OCA/ Agnostic? It sounds like where I am or should be! The icons are a bit off and the iconostasis is pretty nontraditional. In what way are they "a bit off?" I'm serious. You can't just say something like that and not expect to be challenged. As for the iconostasis being "pretty nontraditional," it's actually "pretty traditional" in the Carpatho-Rusyn tradition. There's nothing "liberal" about it. It's just different from what you're used to seeing. I have a sneaking suspicion that the only thing "off" about it to you is that it's in a Roman Catholic context. Okay, have your sneaking suspicions or whatever. I've thought the same of Orthodox churches. They don't look like they follow the style of other icons I've seen. The image of Christ looks almost like Coptic iconography. That's a traditional Carpatho-Rusyn iconostasis? And Coptic iconography is "liberal" (whatever that means)? Regardless, the icons in the chapel are pretty much "normal." I'm still wondering where you think you're qualified to pass any sort of judgment on the iconography in this church. You still haven't described what makes these "liberal." You can find this sort of iconostasis all over sub-Carpathia. Just because an iconostasis isn't some monstrous wooden wall that happens to be decorated with icons doesn't mean it's not "traditional" (again, another word in this context that's meaningless). You can find these sort of open iconostasis in Greek churches, too. Yes, putting non-Ruthenian style icons in a Ruthenian church is liberal. No, I don't have "qualifications" but making giving one's impression in a passing comment on an internet forum is not something I realized I needed iconographic training for. I'll ask LBK what she thinks. Traditional means it follows old architectural/iconographic norms, liberal means it doesn't. I've seen open iconostases. The chapel of my parish has one. It doesn't look like icons floating on grating. What makes you think that these icons aren't in a "normal" Ruthenian style? How many such icons have you seen? No, I don't have "qualifications" but making giving one's impression in a passing comment on an internet forum is not something I realized I needed iconographic training for. If you're going to make a definitive, ignorant comment, even on the internet, prepare to be challenged. I'll ask LBK what she thinks. I think she'd agree with me. There's nothing "liberal" about these icons. What one tradition finds as a "norm," another may find as odd. That doesn't mean that the former is 'wrong,' just different. Your logic leads to the Old Believer schism. Again, just because something is different to what you've seen doesn't mean it's wrong. "The iconostasis you refer to is rather too modern in its structure for my taste, but it isn't outside of canonical content, at least as far as I can see. The resolution of the shot isn't high enough for me to distinguish whether certain necessary details are present in the icons (such as the stars of virginity on the icon of the Mother of God, or the form of Christ's halo), so, if these details are absent, you would be right in your questioning." I would also add that I would find the mosaic in the apse of the Mother of God, shown alone, and displaying a very truncated form of the icon of the Pokrov (without the presence of Christ, and stripped of so many of the elements of St Andrew's vision, which give meaning to the event), more problematic than the openwork of the iconostasis. Or be prepared to be challenged if you make a reasonable comment but use the word "liberal" in reference to something Roman Catholic and Schultz is posting at the moment. Is that an Eastern Catholic iconostasis depicted? Because it sort of feels like it. Reminds me of the RC convent a couple hours away, but with icons. I highly suggest St. Nicholas as they have quite a collection of relics out for veneration. Thirded. And it's only a couple of blocks from the National Cathedral, if you want to check that out. St. John the Baptist is quite nice too though, and the Russian Bazaar might be fun. St. Sophia? You might be able to catch a nice Centering Prayer session, or maybe sit in on an Eckhart Tolle book study! I can confirm the three stars and OWN are present having both been to the Ruthenian Chaprl and owning reproductions of those icons. I would also add the Pokrov icon as shown in the chapel is present in that form in many Greek Catholic and Orthodox Churches. Except that your comment wasn't reasonable and didn't reference something Roman Catholic. It was a putdown of an iconographic style and icon screen type, both of which can be found in Orthodox parishes, simply because it was Eastern Catholic. I would also add the Pokrov icon as shown in the chapel is present in that form in many Greek Catholic and Orthodox Churches. So? does that mean that this truncated, deficient portrayal is in keeping with what the Orthodox Church teaches? That is a complete and total lie. I never implied at any point that I don't like the iconographic style (and I've yet to see a shred of proof that that type of iconostasis is the norm of any tradition) simply because it was Roman Catholic. You and Schultz both owe me an apology for your paranoid misrepresentation of me. Hell, I never even said I don't like the style in general. Just that it is not traditional. More paranoid caricatures. The self appointed Hyperdox Herman police on this forum really need to stop. "liberalized Eastern Catholic", "a bit off", "pretty nontraditional", your words. Words that carry a subtle subtext that certainly doesn't come across as complimentary. The Myrah streaming Iveron Icon ( Hawaiian) will be at St. John the Baptist Cathedral for Liturgy this weekend. The web page is www.stjohndc.org.. The cathedral itself is breathtaking.. Plus the Sretensky Choir will be sing the Liturgy with the Icon present. The Sretensky Choir in Washington, D.C.
With the blessings of His Holiness Kirill, Patriarch of Moscow and all Russia, and as part of this year’s celebration of the 5th Anniversary of the signing of the Act of Eucharistic Communion between ROCOR and the MP, on October 7, the world-famous Men’s Choir of Moscow’s Sretensky Monastery will sing the Divine Liturgy at our church. On Sunday, October 6, the choir will perform in the Library of Congress at 8 pm. Tickets are available from September 5. To purchase tickets, please call (202) 397-7328 or visit Ticketmaster website. On Monday October 8, the choir will perform with concert of liturgical and folk music at the Kennedy Center for the Performing Arts. Tickets may be purchased online. I'm afraid you're mistaken. Your Roman roots are showing. Quite a few EOs on this forum have Roman roots. Why even care what kind of icons people use outside of the Orthodox Church? Remind me again what Orthodox bishop appointed you chief icon ajudicator? Remind me again of which Orthodox jurisdiction you belong to. Wish I had joined this thread earlier, because I would have recommended the Franciscan Monastery of the Holy Land in America, which is not far from the IC National Shrine. The church is beautiful, and the cloisters and gardens are lovely. The grounds have replicas of all the main Holy Land sites. Highly recommended. A great sanctuary of prayer and silence. Went to St. Nicholas for a liturgy. Beautiful. As I said before, bishops are not infallible. By your reasoning, the paintings of non-Orthodox figures in the nave of the church of Holy Wisdom at New Skete are permissible, because bishops have served there. By your reasoning, the modernist reinterpretation of the Resurrection in the church at Chambesy is kosher, because that church is a seat of the Ecumenical Patriarchate, and this painting was by the hand of an Orthodox priest. By your reasoning, the painting of the NT Holy Trinity in the central cupola of Christ the Savior Cathedral in Moscow is permissible, because it is a patriarchal seat, even though this very imagery has been denounced repeatedly over the centuries at Ecumenical and Synodal Council level, including no fewer than two councils of the Russian church. I base what I write on iconography on the liturgical, doctrinal and patristic traditions of the Church. Over the years, I have written monographs on various aspects of iconography, including several on suspect or uncanonical images, both of historical provenance, and of more recent appearance. I have made these documents available to nine priests (four of them priest-monks), a bishop of metropolitan rank, and seven iconographers, all of whom hail from several countries and jurisdictions between them. Not one of them has voiced any concern or correction of any of my work; I have only received positive comments and encouragement to do more in this vein. I am also approached from time to time by one or other of the iconographers for advice on whether this or that image is suitable to be painted, or for help in painting an obscure saint for which they have been unable to locate a prototype. I have also provided hundreds of icons over the years to three local churches - two parish churches and a monastery. But, I suppose, all this don't matter a hill of beans to some people here. To them, I'm just another "online pontificator". That is a complete and total lie. I never implied at any point that I don't like the iconographic style (and I've yet to see a shred of proof that that type of iconostasis is the norm of any tradition) simply because it was Roman Catholic. No one said it was "the norm," just that it was acceptable. You and Schultz both owe me an apology for your paranoid misrepresentation of me. No, I don't. I merely said I had a sneaking suspicion and didn't accuse you of anything. If anything, you owe Clarity an apology for throwing out words like "liberal" and "non-traditional" in order to paint some Conservative v. Liberal political BS into the topic. LBK managed to express some valid concerns about the apse mosaic w/o resorting to jingoism. We'll stop when non-Orthodox stop pontificating about Orthodoxy. How nice that we see one picture and we start throwing trash and insults to eachother. Yes, you made accusations and continue to do so (even in this very post I'm replying to), and none of your equivocation is getting around that. Let me know when you're ready to man up and apologize.